Ever Since i saw DK's Butter Naan, I wanted to try them. and now the record strikes with four trials. here the photograph is of the second trial. 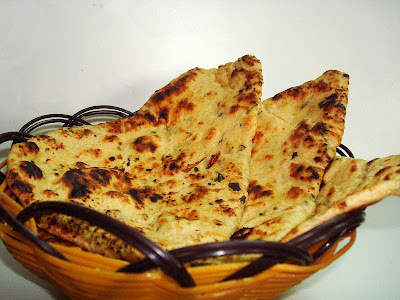 for the recipe of Butter Naan, i going to refer you, DK's Recipe, which is the best. but the method has little variation's. Here in India, you need 10-15 minutes, for yeast fermentation. and the time for the raise of dough is from 90 minutes to 120 minutes. The better and fast way is to place the dough in a hot box and put it in a dark place. 1. After you have rolled the dough(preferably of medium thickness. it should not be very thick), pull one end of the rolled cirlce dough for the oval shape. and stretch the other end with both of your hands. ( i would soon post an image at this point). 2. Apply water on one side and put it in the Hot Tava, with water applied side resting on the tava. Keep it on High Flame and cover it with a lid. after one minute, check for the bubble raising on your Naan, and check whether your bottom part is cooked. Now place the top part on the direct flame, keep showing all points of the naan on the flame, to ensure proper cooking. this should take less than a minute and it cooks so fast, so make sure you don't burn them. When my hubby was in IIT, he had tasted this, and was asking me all these year's to try this. I tried googling, but i couldn't land on a perfect recipe. then i tried my hand over this, which really surprised me with amazing taste. 1. Pressure Cook the soaked Urad Dal upto 4-5 whistles. mash them and keep it aside. 2. In a Heated Pan, add oil and heat it, add mustard if you wish and add the ginger and green chili's. saute them and add the sliced onions and fry them. Now add the tomatoes and saute them, till they get cooked. 3. Now add the Okra and fry them, add the potato cubes, salt and Turmeric powder and chilly powder, fry them for a minute. 4. Add the mashed urad dal and add a cup of water, mix well. close it with a lid and let them get cooked in a slow flame for about 10-15 minutes. this makes the subzi thicker and the okra and the potato gets cooked. before you switch off the flame, add the chopped coriander leaves-2tsp and close it with the lid. You can also make this subzi, little watery and add more okra's, which will be very yummy. also you can this with black whole Urad Dal. I was very much less interested in blogging because of the climate over here. As the sun starts to shine again, i feel fresh to try recipe's. last week, we just managed with Rasam. Now slowly iam driving on first gear, before i give full throttle, here is my Beetroot Kootu, which actually i liked it. 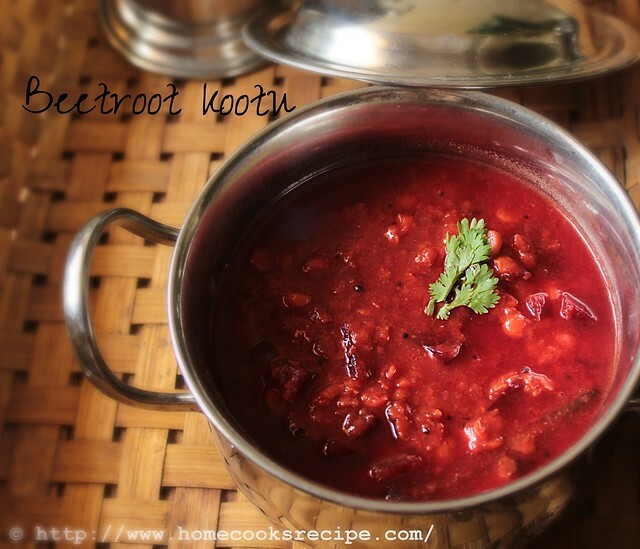 If any Beetroot hater's reading this, give a try to this simple yummy recipe. First Soak the Chana Dal in hot water for 2hrs, or atleast 30 mins. then pressure cook the chana dal, with the chopped Beetroot, salt and garlic with some water. let the whistle count be 4 whistles. Cut the Onion's finely. In a Pan, Heat the oil and add mustard, when it makes some sound add curry leaf, red and green chilli's. saute them well. now add the onion's and saute them. 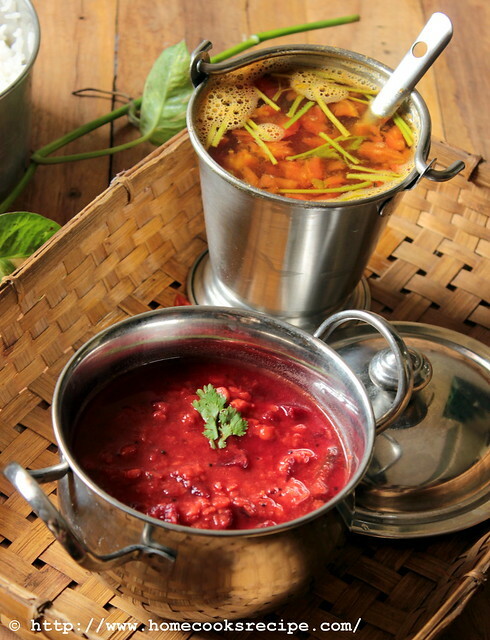 When onions are cooked, add the beetroot and chana dal, say the pressure cooked one's to the pan and mix well. Add salt and let it boil. add water to get a desired consistency. ** If you are not calorie conscious, add a tbsp of ghee, before serving. it enhances the taste. Now serve it with Hot Rice or with soft chapathi's. 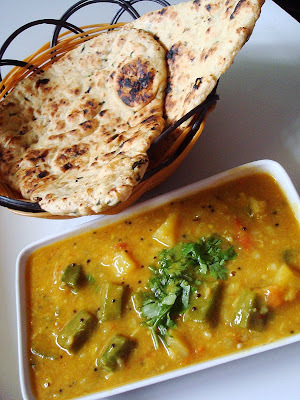 It tasted so good with chana dal. Since i prepare lunch, only for me, this single dish was like a whole meal for me. If you prefer, you can also add coconut, when it is prepared dry, without any water added.